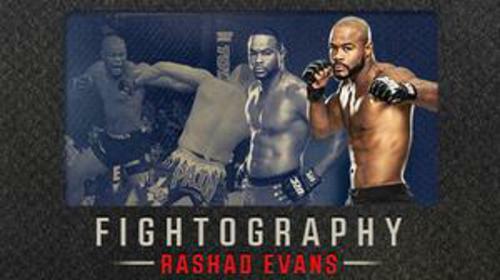 Future UFC champion Rashad Evans started his Octagon journey as a tubby heavyweight given no shot of winning The Ultimate Fighter Season 2. Here, “Suga” gives an emotional play-by-play of his early-career battles with frustration and self-doubt. Fightography: Rashad Evans Aug 7, 2014 (17:05) Although he eventually became UFC champion and one of the biggest stars of the light heavyweight division, Rashad Evans started his Octagon journey as a tubby heavyweight who was considered the weakest contender on the second season of The Ultimate Fighter. In this edition of Fightography, “Suga” gives an emotional play-by-play on his early battles with frustration and self-doubt, and describes the cathartic moment that led to him finally believing in himself on the eve of his fight with UFC icon Chuck Liddell. Rashad Evans vs. Sam Hoger UFC Fight Night Apr 6, 2006 (21:28) Following his TUF 2 finale win over the 6’7” Brad Imes, undefeated “Suga” Rashad Evans dropped to his proper division of light-heavyweight to start his Octagon career against the 6-1 Miletich protege Sam “The Alaskan Assassin” Hoger. Rashad Evans vs Jason Lambert UFC 63 Sep 23, 2006 (17:43) The Ultimate Fighter 2 winner Rashad Evans looked to extend his unbeaten streak versus Jason Lambert. 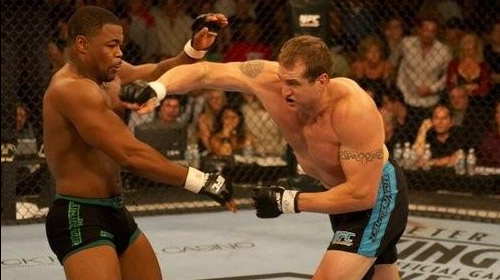 Rashad Evans vs. Sean Salmon UFC Fight Night Jan 25, 2007 (16:36) Rashad Evans was looking to keep his perfect record alive against UFC® newcomer Sean Salmon. While Salmon had other ideas, nothing went as planned for him in this fight as Evans delivered one of the greatest highlight reel strikes ever. Rashad Evans vs. Michael Bisping UFC 78 Nov 17, 2007 (35:41) Someone's "0" had to go as Rashad Evans and Michael Bisping battled it out at UFC® 78. 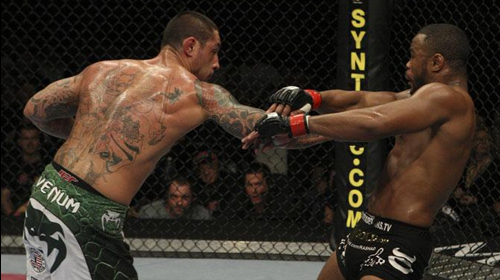 Both were coming off of controversial decisions and both were looking to leave no doubt about this fight. Rashad Evans vs Tito Ortiz UFC 73 Jul 7, 2007 (32:35) "Suga" Rashad Evans faced "The Huntington Beach Bad Boy" at UFC 173 in a middleweight fight. 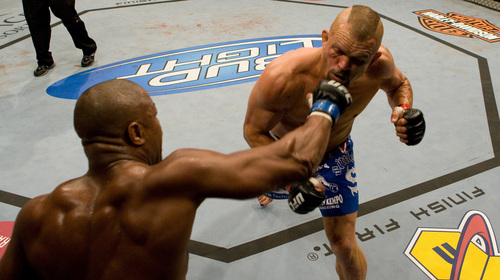 Rashad Evans vs Chuck Liddell UFC 88 Sep 6, 2008 (22:35) A tale of two fighters: Chuck Liddell was once the Light Heavyweight Champion who looked invincible during the height of his reign. 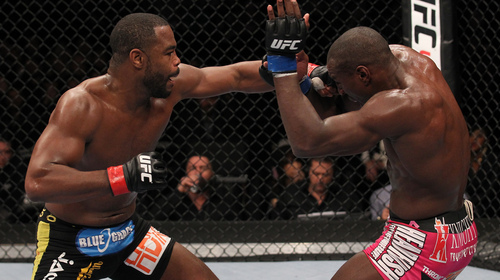 Rashad Evans was the undefeated young gun who received his start on The Ultimate Fighter show. 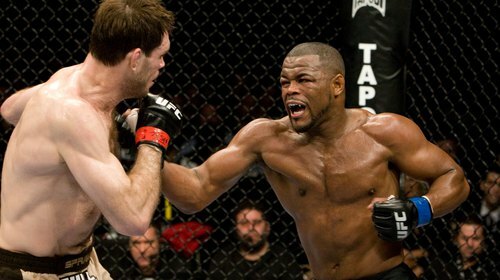 Rashad Evans vs Forrest Griffin UFC 92 Dec 27, 2008 (30:11) Two of the most well known TUF winners squared off at UFC 92 with the light heavyweight championship on the line. 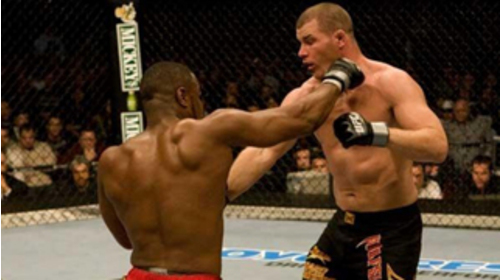 Coming off a stunning KO of Chuck Liddell, Evans looked to keep his undefeated streak alive against the champion Forrest Griffin. Lyoto Machida vs. Rashad Evans UFC 98 May 23, 2009 (29:23) A first for the UFC: two undefeated fighters battling for the Light Heavyweight title. 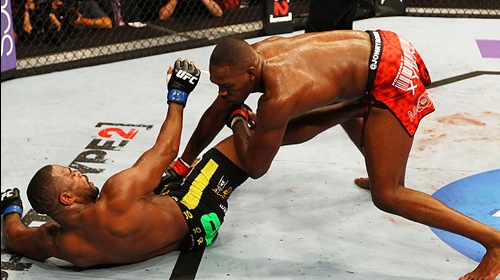 Newly crowned Rashad Evans wanted to hold onto his belt, but Lyoto Machida planned on spoiling his first title defense. Rashad Evans vs. Thiago Silva UFC 108 Jan 2, 2010 (30:48) Rashad Evans’s resume included a UFC light heavyweight championship belt, TUF champion, and TUF coach. Thiago Silva couldn't let these impressive accolades distract him, as the winner of this fight would be right in the mix for a title shot. Rashad Evans vs. Rampage Jackson UFC 114 May 29, 2010 (37:59) Two fighters known not only for their fierce punching and striking power, but also for their animosity. 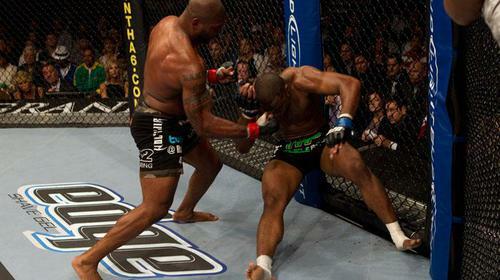 This bout between "Suga" Rashad Evans and Quinton "Rampage" Jackson is one of the biggest grudge matches in UFC history. These guys genuinely hated each other. Rashad Evans vs. Stephan Bonnar UFC Fight Night Jun 28, 2006 (22:35) The Ultimate Fighter veterans Rashad Evans and Stephan Bonnar squared off in a clash of styles. Would Evans wrestling background prove to be the difference, or would Bonnar's stand up and jiu-jitsu win out? Rashad Evans vs Tito Ortiz UFC 133 Aug 6, 2011 (31:48) Tito Ortiz shocked the MMA world when he beat Ryan Bader at UFC 132, and by doing so he earned himself a bout with the number one contender, Rashad Evans. Rashad Evans vs. Phil Davis UFC Fight Night Jan 28, 2012 (32:12) In a light-heavyweight title eliminator, former UFC light-heavyweight champ Rashad Evans, who was a win away from challenging for the belt he once had, squared off with the former NCAA D1 National Champion wrestler, Phil “Mr. Wonderful” Davis. Antonio Rogerio Nogueira vs. Rashad Evans UFC 156 Feb 2, 2013 (31:27) Former UFC light heavyweight champ Rashad Evans locked horns with BJJ ace and underrated striker Antonio Rogerio Nogueira at UFC 156. Rashad Evans vs. Dan Henderson UFC 161 Jun 15, 2013 (33:50) In the UFC 161 main event, light heavyweight stars faced off when former UFC champion Rashad Evans took on former PRIDE FC champion Dan Henderson. 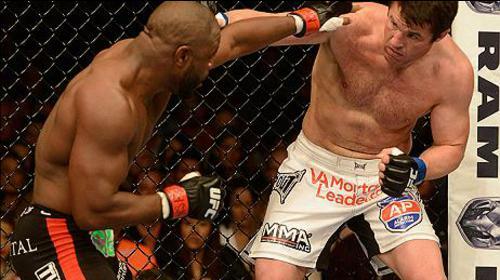 Rashad Evans vs. Chael Sonnen UFC 167 Nov 16, 2013 (16:53) Two friends turned to foes as Rashad Evans and Chael Sonnen battled at UFC 167. 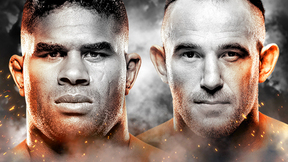 Both fighters entered the Octagon at similar points in their careers, looking to make another run at a UFC title.